A Pure & Beautiful Realism as a Meditation on the Reality of Climate Change | B the Change. 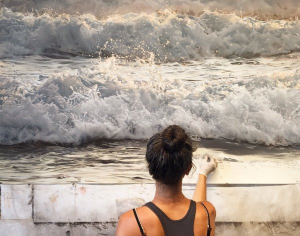 Zaria Forman‘s pastel drawings transcend photorealism, bringing the eye and heart into a mystery so strong the mind begins to work differently. Inspired by her mother, Rena Bass Forman, who planned an expedition to Greenland but never made it when she succumbed to brain cancer, Zaria honored the photographic work her mother gave the world with large scale drawings benefitting 350.org, a movement that champions a safe climate and a more equitable world. “I have dedicated my career to illuminating these projects with an accessible medium – one that moves us in a way that statistics may not,” Zaria says, after sharing that experts predict ice free Arctic summers as early as 2020 and sea levels predicted to rise 2 to 10 feet by century’s end. Art moves us in a way statistics and “scary news reports” may not, which is why Zaria is focused on presenting the beauty of these places, rather than the devastation already underway. 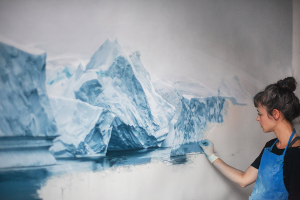 Zaria draws with soft pastels, however, some consider her works “paintings”; Zaria’s preferred tools are her own fingers, touching the surface as part of her meditative painting process. 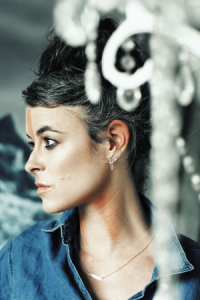 The inspiration for her drawings began in early childhood when she traveled with her family throughout several of the world’s most remote landscapes, which were the subject of her mother’s fine art photography. Born in South Natick, Massachusetts, Zaria studied at the Student Art Centers International in Florence, Italy and received a BS in Studio Arts at Skidmore College in New York. Her works have been in publications such as Juxtapoz Magazine, National Geographic Magazine, Huffington Post, and the Smithsonian Magazine. Her drawings have been used in the set design for the Netflix TV series House of Cards. Residing in Brooklyn, NY, Zaria has been invited aboard the National Geographic Explorer as an artist-in-residence this coming November and December, traveling to Antarctica. On Saturday, July 23, 2016, Zaria was a featured artist for both drawings and a sound piece at the inaugural OZY Fusion Fest in Central Park, NYC at the Rumsey Playfield Summer Stage where she shared the day with some very powerful icons of the century: Bill Gates, Broad City’s Abbi Jacobson and Ilana Glazer, Wyclef Jean, Andra Dae, and Malcom Gladwell. Her next solo show will take place at Winston Wächter Fine Art’s Seattle location, in June 2017.